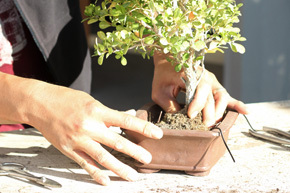 In this article, we'll review the basic steps in repotting your tree. Elements such as tree positioning and soil mix components will be reviewed in a different article. 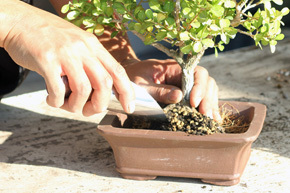 Remove your old tree from the original pot by loosening the soil on the edges of the pot. 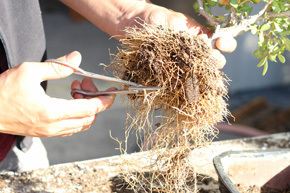 Use a repotting scythe if needed to cut away old roots attached to the side of the pot. If your previous tree was tied to the pot with wire, cut the old wire off. Separate the tree from the pot and set aside the old pot. At this point, your tree should have a solid root ball around the roots. Slowly remove the soil from the root ball with a root hook working from underneath the tree outwards as well as around the sides. The amount of old soil you remove from the root ball is dependent on the quality of the old soil. Typically, you'll want to remove 60-70% of the old soil. 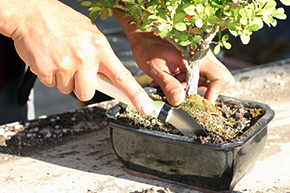 After removing the old soil, carefully trim off old or rotten feeder and hair roots. Doing this will help the tree develop new stronger roots in the new soil. Certain species of trees don't like to have their tap root cut so only do so if you are certain it will work with your species. Prepare your new pot with drainage screens and wire. We recommend reviewing this article if you've never prepared a new pot before. Pour a layer of soil mix along the bottom of the pot. After the base layer is set, form a little hill in the center of the pot where the tree will be set upon. Place the tree into the pot. While firmly holding the pot, twist and maneuver the tree's roots into the hill. At this point, secure the roots with wire to stabilize the tree. Check your tree's position and tighten further when the tree is in its desired position. With a soil scoop, fill the remaining sides with your soil mix. You'll want to fill the soil close to the top of the pot but not above the level of the top of the pot. 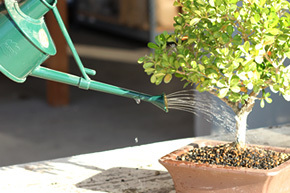 Doing so will ensure that water will remain in the pot during watering rather than run off the sides. 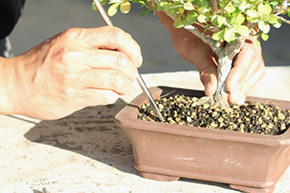 This is one of the most important steps in repotting your tree. Make sure that you do not have air pockets in your soil. Air pockets around the roots will dry out the roots and may cause your tree to die. 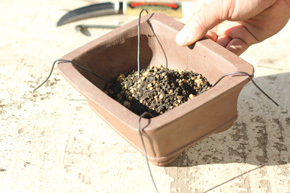 With a repotting chopstick, maneuver the soil underneath and in between the roots. Fill in all the holes around your roots. When all air pockets are filled in, the tree will feel much more stable in the pot. The last step is to water your tree thoroughly. Water both the foliage and the soil. Water your tree until see the water draining through the bottom drainage holes of the pot. If the water is pooling on the top of the soil, let it soak in first. Repeat watering until the soil is completely watered.